It early age Subhas was drawn towards the works of Swami Vivekananda (1863-1902) as he accepted: "I was barely fifteen when Vivekananda entered my life, then there followed a revolution within and everything was turn upside down." Subhasbabu writes : When I was in Presidency College, I along with my group followed the teachings of Ramakrishna and Vivekananda but emphasised service as a means to spiritual development. It interpreted social service not in terms of building hospitals and charitable dispensaries, but as national reconstruction, mainly in the educational sphere. We called ourselves as neo-Vivekananda group and our main object was to bring about a synthesis between religion and nationalism, not merely in the theoreticaol sphere but in practical life as well. Subhasbabu used to speak on Swami Vivekananda and His influence. 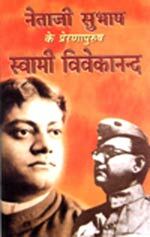 In the talk 'The Individual, The Nation and The Ideal' given at the Hooghly district Students' Conference in Chinsurah on Sunday 22 July 1929, he said : The ideal that enthuses the student community of Bengal, is the ideal of Swami Vivekananda. Under the hypnotic spell of that glorious ideal, the Bengalee youth went in with grim determination for a life of purity and spiritual powers freed from all taint of selfishness and shabbiness. As the root of construction of the society and the nation lies in the unfoldment of individuality. That is why Swami Vivekananda was never tired of repeating that 'Man Making' was his mission. ....in the last decade of the 19th century and the 1st of the 20th, the soul stirring message of Swami Vivekananda -'Freedom, freedom is the song of the soul', burst the locked gates of the Swadeshi's heart and came forth in a flood of irresistible might, the whole country caught it up and nearly went mad. It was Swami Vivekananda who had on the one hand, boldly asked his fellowmen to shed all sorts of fetters and be 'men' in the truest sense of the term; and, on the other hand, laid the foundation of true nationalism in India by preaching the essential unity of all religions and sects. But the image of freedom, whole and entire that we come across in Vivekananda, had not yet been reflected in the realm of politics of his age. Subhasbabu in his speech at the Rangpur Political Conference dt 30 mar 1929 says : It was Swami Vivekananda who gave a new turn to the history of Bengal. As he repeatedly said, man-making was his mission in life. In the work of man-making, Swami Vivekananda did not confine his attention to any particular sect but embraced the whole of society. His fiery words -"let a new India emerge through the workshop and from the huts and bazaars' - are still ringing in every Bengali home. 'India saved means Humanity saved' was Subhasbabu's important address at Narail on 17 July 1931. In it he says : Swami Vivekananda breathed life into the people by preaching the message of freedom. He realised that it was the light of freedom that could illumine the life of India. Through His lectures, poems and writings he declared that 'Freedom is the song of the soul'. Vivekananda spoke of spiritual freedom no doubt but there is no disputing the fact that when the soul is roused, manifestation of awakening appears in every department of life. When a man is in good health, every limb and organ has the glow of life. On the contrary, when he is diseased, every limb and organ shows signs of paleness and morbidity. This is equally true in the case of a nation when the desire for freedom takes root in the heart of a nation, it is disseminated in all the spheres of life. I cannot write about Vivekananda without going into raptures. Reckless in his sacrifice, unceasing in his activity, boundless in his love, profound and versatile in his wisdom, exuberant in his emotions... I can go on for hours and yet fail to do the slightest justice to that great man. He was so great, so profound, so complex. He was a Yogi of the highest spiritual level, in direct communion with the Truth, who consecrated his whole life to the moral and spiritual uplift of humanity. Swamiji harmonized the East and the West, religion and science, past and present. And that is why he is great. Our countrymen have gained unprecedented self-respect, self-reliance and self-assertion from his teachings. He was so great, so profound, so complex. A Yogi of the highest spiritual level in direct communion with the truth who had for the time being consecrated his whole life to the moral and spiritual uplift of his nation and of humanity, that is how I would describe him. If he had been alive, I would have been at his feet. “The Good for Nothing Boy” of Calcutta! Have a great ideal to die for..
O ye modern Hindus, de-hypnotise yourselves. The Lord Buddha is my Ishta — my God. One Touch One Glance of His Infinite Grace..!!! Each soul in potentially Divine!